a) 5 mm BBO probe with gradient facility and auto sampler with VT facility. Tuning range from from 109Ag to 31P also observation of 19F with 1H decoupling. 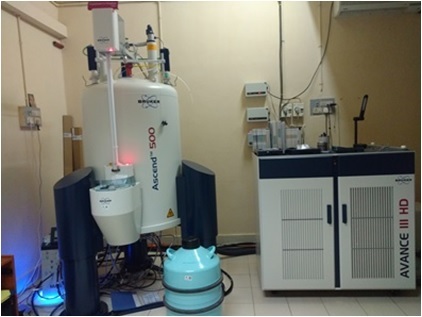 1D NMR, 2D NMR, Multi-nuclear NMR; Variable temperature measurements. 5 mg for 1H NMR and 50 mg for 13C NMR experiment. Compounds should be highly pure and soluble in commonly available solvents . Solubility, nature of compound [carcinogenic, toxic, lachrymatory, explosive, hygroscopic] and Structural formula [contemplated / known] to be mentioned. The sample must be soluble in 0.6 ml of deuterated solvent. Facilities available for 1D NMR, 2D NMR, Multi-nuclear NMR; Variable temperature measurements. RADIOACTIVE MATERIAL should not be submitted.